It's the 22nd century. A female cyborg is called on a mandatory mission, forcing her to leave her greatest love. Both despondent from the separation, one departs on a life changing journey to a place which redefines imagination. In a metropolis at the north pole on planet Earth, a female cyborg ("The Occupant") is called on a mandatory long term mission to travel along a space elevator through the Aurora Borealis to serve aboard Space Gate Auroras. Forced to leave her pregnant partner, another female cyborg ("The Loved One"), they say goodbye for an extended period. Two women, human or not, in love, are forced to separate and say goodbye for an extended period of time as one departs on a life changing journey to a place that redefines imagination. Auroras is a seven minute long science fiction short film with an overarching feature storyline. The short was originally written in 2010 and is comprised of a basic storyline executed in an complex technological way. Development has been extremely slow because the film is primarily made by one independent filmmaker, Niles Heckman, with limited resources. It's been a very slow but steady side project, and is nearing completion. Due to its limited budget combined with high quality computer graphics using only two computers, it's been over three years in production. The film is a duel production venture between Heckman's AURORA-LAB, a small independent film collective based out of Los Angeles (named after this project) and Marauder Film, a San Francisco production company founded by Bastiaan Koch. Science fiction is not about the future, it's about the present. Marriage equality and equal rights for all people, regardless of sexual orientation, has come a long way in recent years but still has a long way to go. The film has a feminine theme and an unconventional storyline that would likely not be risked in a large budget Hollywood film. Set in a technologically advanced future, the overarching feature storyline is an embrace of the divine feminine over male dominance. Occupant kissing Loved One as she is about to depart on the space elevator. (The elevator tower base structure behind splits them in frame. Symbolic of their separation). The project has a Japanese theme and influence. From a visual standpoint, the film is live action and would ideally be classified as "live action anime." Primarily influenced by the work of Japanese Anime director Makoto Shinkai, whose style of detailed art direction, extensive textured skies, bloomy optics, and very saturated colors give a stunning aesthetic. The aurora borealis is one of the most exotic and beautiful atmospheric phenomena. In eastern culture, a child conceived under the Aurora is often times thought to be extremely good luck. This ties in with the film's storyline and is the primary visual theme throughout the film. This is an opportunity to get involved in a project which is very dear to us. Due to the professional quality of the production, we feel that we could raise funds privately, but with potential creative compromise and would prefer to democratize the project with a crowd sourcing solution allowing for anyone interested to become part of our small team. The film is approximately 75% complete. Computation time for rendering high end computer graphics is very intensive. We are raising a modest amount to help us greatly increase our render resources, streamline post production, and recoup some existing expenditures. Any additional funds raised over the goal will go directly to expanding the script for a feature length film. *Work in progress contact sheet. (White shots are still to be fully rendered). Filmmaker chatting with Liftport Group founder Michael Laine on the podcast about science fiction, space elevators, and crowd sourcing. Aside from some audio work, the film needs finished post-production imagery. Top of the line computer graphics in feature live action and animated films typically costs $1,000,000 per minute and is done by dozens or hundreds of incredibly talented artists rendering on thousands of machines. 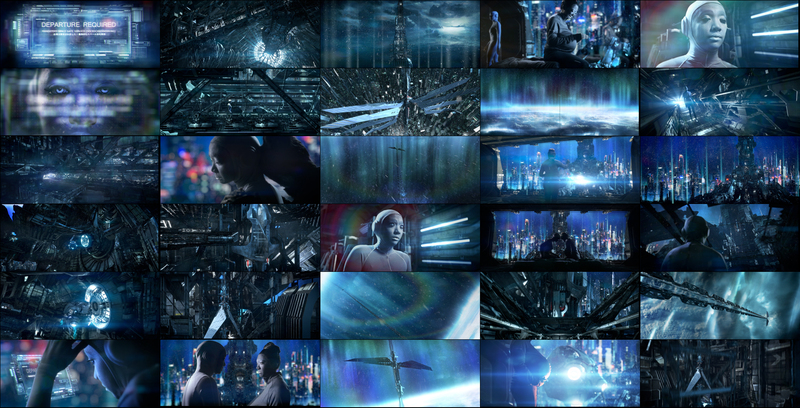 This film will have a comparable quality level of imagery and is primarily created by one person on two computers.